The Wine Pairing Weekend group will be sharing their Merlot and food pairings Saturday, October 14 at 11am EDT on Twitter (join the conversation by using hashtag #WinePW) and blogging about their Merlot tastings and pairings, check out their adventures at the end of this post. As I write this post, Sonoma and Napa are battling some of the worst fires ever to hit Northern California’s wine country. My heart breaks for the people, lost homes, and livelihoods. Sonoma and Napa hold a very special place in my heart, having once lived in Healdsburg. Healdsburg was my home in the late ’80’s early ’90’s, I worked in the tasting room and coordinated special events at Clos du Bois Winery. Back then, Merlot was the trending varietal. Reflecting now, what was not to like about Merlot; it was softer, smoother, more plummy fruit, fewer harsh tannins when compared to Cabernet Sauvignon, easy to sip, and paired well with a variety of foods. But then came the movie “Sideways” and an overplanting of Merlot in-ill suited sites and Merlot fell out of favor. Fast forward to today, a select number of California wineries have fine- tuned where they plant Merlot, matching climate and soil to best suit the Merlot varietal resulting in outstanding Merlots. 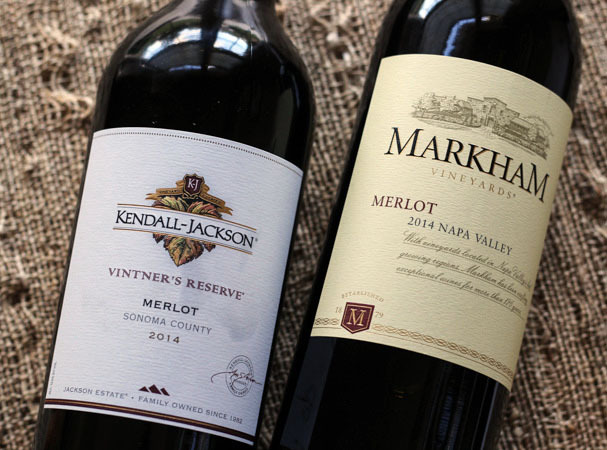 So with Sonoma and Napa on my mind and in my heart, I celebrate #MerlotMe with a 2014 Kendall-Jackson Vintner’s Reserve Merlot, Sonoma County and a 2014 Markham Merlot, Napa Valley. Ruby in color. Nose of dark cherries. On the palate, dry, medium acidity and tannins, notes of dark cherries and plums. Nice lingering finish. Ruby in color. Slight nose of vanilla and leather. On the palate, dry, medium acidity and tannins, notes of cherries, plums, black tea, vegetal notes and a lingering finish of chocolate notes. 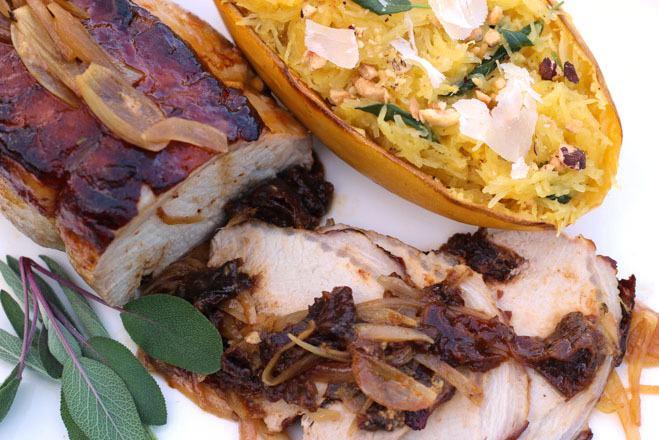 I paired both Merlots with a roasted pork loin with brandy prune sauce and roasted spaghetti squash. The prune sauce was in harmony both in texture and body with the fruit flavors in the Merlots. 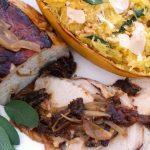 The thyme in the pork loin and sage in the spaghetti squash brought herbal notes out in the wine, especially the Markham Merlot. The pairings worked perfectly enhancing both the wine and food making for a memorable dinner. In a medium saucepan combine prunes, brandy, water and cloves. Bring to a boil and then reduce the heat and simmer for 15 minutes. Strain the prunes from the liquid, set the prunes aside to cool. Strain out the cloves and reserve the liquid. Mix Dijon mustard, honey, and lemon juice together. Set aside. Make a hole in the pork loin by inserting a long thin knife in the middle of one end toward the center of the loin. Repeat at the other end, making an incision that runs lengthwise through the center of the loin. If needed use your fingers to make the opening 3/4 inch wide. Stuff about 20 prunes into the incision made in the pork loin center. Place the pork loin fat side up on a shallow oven proof roasting pan. Pour 3/4 of the mustard honey mixture over the pork loin. Sprinkle about one tablespoon of the thyme leaves over the pork loin. Cover and refrigerate for about 2 hours. Bring to room temperature before roasting. Preheat oven to 425 F. Cook for 15 minutes. Remove the pork loin from the oven and reduce temperature to 350 F. Carefully move pork loin to a plate and scatter the shallot slices and remaining prunes on the bottom of the roasting pan. Place the pork loin on top of the shallots and prunes and pour reserved brandy liquid over the pork. Roast the pork loin for another hour, basting every so often. During the last 10 minutes of cooking time, pour the remaining mustard honey mixture over the pork. Check the pork loin temperature; 140 F for slightly pink and 145 F for more well done. Rest the pork loin for 10-15 covered with foil before slicing and serving. Serve with the prune/shallot sauce. Preheat the oven to 400 F. Cut the squash in half and remove the seeds with a spoon. Line a baking sheet with parchment paper. Place the squash halves on the baking sheet cut side up. In each squash half put one tablespoon of butter and two sage leaves. Bake for about one hour or until flesh is soft when pierced with a knife tip. Set aside to cool for about 15 minutes. Scrape the flesh out with a fork to get spaghetti like strands. Heat the remaining 3 tablespoons of butter in a large frying pan over medium heat. When the butter is melted, add the remaining sage leaves. After a few minutes add the squash and mix. Cook for about 3-5 minutes. Season with salt and pepper to taste. Serve in the hollowed out squash skin or in a bowl and sprinkle with Parmigiano-Reggiano cheese. Delicious choices with the roast pork-yum!!! Thanks! 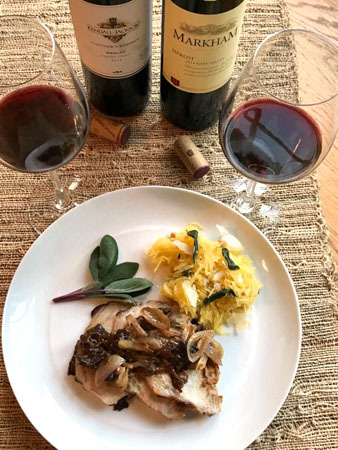 Fall flavors with Merlot is a winning combination! Love, love, love spaghetti squash. Your roast pork look delicious. Nice choice of Merlots! I know, I can’t get enough spaghetti squash as the season begins. I tend to pick up gentle prune flavors in Merlot and I’m thinking you nailed it with your match up here. Pork tenderloins often come packaged in two and I think that making a couple of sauces would be a fun way to mix it up during the week. I love food-friendly Merlot and I’m so pleased to build up our virtual cookbook around this grape! Great post, thank you! Thanks Jill. Pork tenderloins usually do come two to a pack, however, I used a pork loin roast. The cooking time will be different for pork tenderloin vs. pork loin roast. You could substitute pork tenderloins in this recipe and reduce the cooking time and not stuff the prunes, but just lay them with the shallots in the pan topped with the pork. The pork loin with prunes was a perfect pairing with Merlot and great for entertaining/holidays. Wow, that dinner looks absolutely beautiful and I’m sure the prune sauce was just magic with the two Merlot wines. Thanks Nicole. The prune sauce was the magic element for the Merlot pairing. Mmm, I can see the prune sauce going well with the Merlot. And pork + Merlot is definitely a good combo! So true, pork does work well with Merlot. Cheers!